Please create an account to take snapshots and to save your building projects. Simply enter the email address that you used to register your account in the field below. A link will be sent to your email containing instructions on how to reset your password. Using the menu above, you can navigate between your different types of saved work, projects and uploads. Use this button to make changes to your profile information, or to change your password. 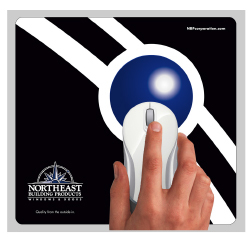 End your session by clicking Sign Out. All of your work will be available the next time you sign in. In "Project Desktop" click the save button once you're satisfied with your design. Upload a photo in order to save it to your account. If you wish to change your account password, you will need to provide your current password below. Textured Fiberglass emulates the look and feel of oak woodgrain, making it ideal for staining. They can also be painted a solid color. Fiberglass doors feature high-definition embossed patterns with lots of depth to mimic a true wood door. left-to-right through different elements to easily design your door. Different options will be available based on the selections you make in other tabs. Do not use your browser navigation buttons or you may lose your work while designing your door. By default, your selections will apply to the door only, but if your selected configuration includes a sidelite, you may choose to modify it separately by making your selection here. When you're satisfied with the look of your door, you can click Save This Design and name your door design. 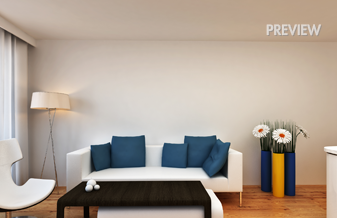 You will be able to apply your saved designs to pictures of homes if you choose to. Each glass has a privacy value attached to it. You can reference this scale to compare them. By default, your selections will apply to all available glass (door, sidelites, transom) but if you want to choose glass specifically for one or the other, you may choose to modify them separately by making your selection here. Caming is the metal banding that joins individual pieces of glass together to form a decorative glass lite. Certain glass designs may be available with more than one caming option. The first one in the list will be applied by default, but you can click on other options here if they are available. 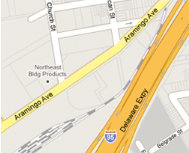 An unobstructed, well centered view of the area of interest. Crop the image to bring your door into focus. To display your door in an optimal way, we require you to crop your image. To define what will show around your door design, place the crop box around the focal point of your photo, then click CONTINUE. Align the corners of the box with the corners of your door opening to define the area your door design will occupy. Make sure to consider transom and/or sidelites if you have included them in your design. If your build includes and sidelites, transoms, or elements outside of door, please include them when choosing your corners. Use these options to share your project with people you know. Click EDIT DESIGN to modify the door configuration. Click CHANGE BACKGROUND to replace the image youï¿½re viewing your door on. 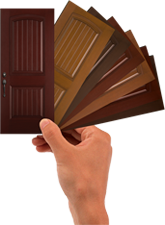 Select all the door designs you would like to compare and click COMPARE SELECTED to view the comparison page. Select all the door designs you would like to delete and click DELETE SELECTED to remove them from your list. Be careful! This cannot be undone! Disclaimer: The NBP View entry door visualizer is a tool to help inspire and envision a wide range of possibilities for a home's entryway(s). 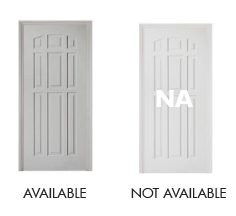 Availability of certain selections or configurations may depend on a home's specific door parameters and sizing, along with current availability of NBP's offerings. 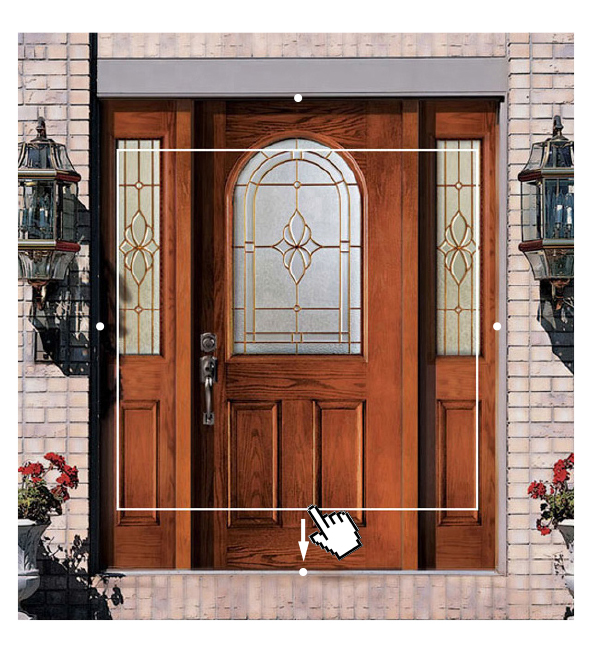 Due to the nature of online viewing the representations of door elements (including but not limited to dimensions, glass, colors, finishes and textures, hardware, etc.) shown on these pages may vary slightly from the actual materials. WE LOOK FORWARD TO BUILDING WITH YOU. for which you can create one or several DESIGNS. 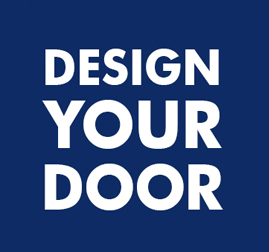 To begin a new DESIGN for your PROJECT, select DESIGN YOUR DOOR. 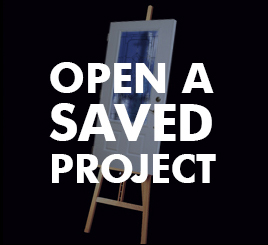 To open an already saved PROJECT, select OPEN A SAVED PROJECT. so that you can access these in the future. project a different name so that you can refer back to them in the future. You can save multiple DESIGNS. When you have developed a DESIGN you want to save, select SAVE THIS DESIGN. VIEW ON A HOME allows you to upload your own photo or choose from our gallery. or print your projects for future reference. To save any PROJECTS you will be working on, you must first CREATE AN ACCOUNT. To proceed without the ability to save, select BUILD WITHOUT LOGIN. PROJECTS that are not saved will be lost forever. When choosing a configuration, it is best to choose something similar to what you have now. Sizes and availability vary and not every configuration can fit into every existing opening. For example, if you have a single door now, choosing double doors may not be ideal to fit into an existing opening, unless you plan on building a new larger opening to accommodate. All designs are presented as viewed from the outside, looking at your home. choose Textured Fiberglass. This is the only surface that can be stained. that can be painted any color. This is more limited in size offering. Smooth Steel offers 22 gauge hardened steel that can be painted any color. This choice has the most versatility in both style and size. appear faded out, that means they are not available in the surface chosen (NA). When choosing a glass style it is important to be aware of color and Privacy Ratings. all insulated into one sealed unit. insulated glass. Caming is available in several colors, but not all glass choices are available in all caming colors. choose Platinum caming and Satin Nickel hardware to complement. have some obscurity to them). Level 7 and higher provides the best obscurity. insulated between the glass unit. The inside glass is obscure hammered. light and color around it providing a beautiful piece of glass. Clear, Low E, internal mini blinds, external grill and internal grill choices. for a window covering over the door. When closed they offer a privacy level 9. Choose External grill to have the grill color match the door. with internal grills, the door will be blue and the internal grill in the glass will be white. 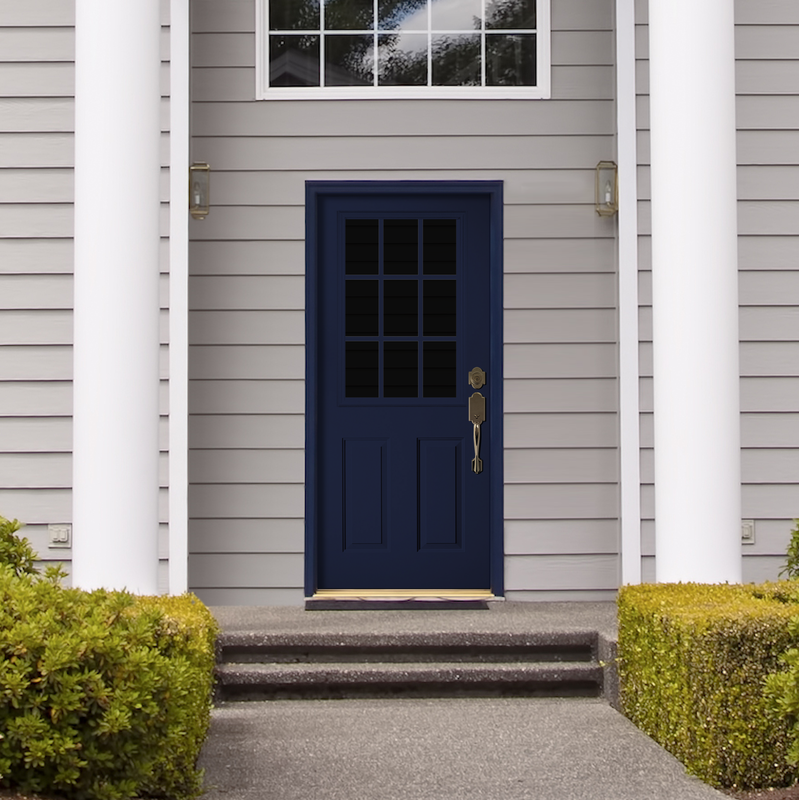 Any Smooth surface (Steel or Fiberglass) door style chosen can be painted. You can choose one color for the inside and a different color for the outside. Or all one color in and out. Textured Fiberglass can be stained or painted. look like. Consult your professional for actual color and stain samples when ordering. Custom Paint color option is also available at time of order. NBP VIEW will only show outside view. provided will be matched to the exterior frame color chosen. Hardware is offered in four finishes. Some hardware is not available in all four finishes. this hardware style is not available in the finish chosen. of Kwikset hardware available and offers a Lifetime Warranty. the need for a locksmith. You can also rekey your new locks to your existing Kwikset key. Smart Code hardware offers keyless entry via a push button combination. or in the middle, depending on door style pattern. to best envision how your project will look. a similar configuration, it may appear distorted and sized improperly. Choose a photo from your computer to upload. 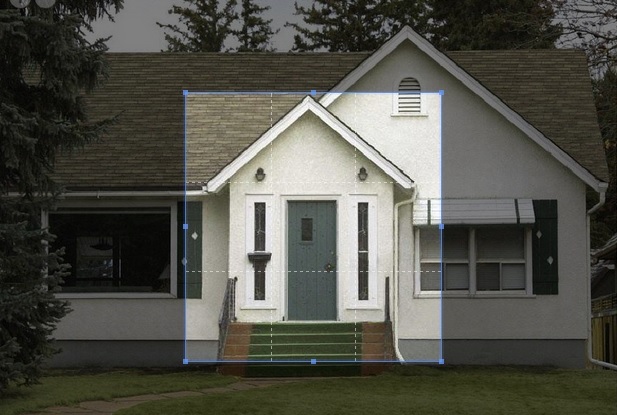 Then use our cropping tool to create a clear and prominent view of your door. you have generated for any PROJECT you have saved. an opening for a home for which you have one or several door DESIGNS. your project will not be saved. Projects that are not saved will be lost forever. your current project before clicking or it will not show again. door style, glass style, colors, etc. It will redirect you back to the build section. against different backgrounds or on different homes. to your professional when ready to order. you would like to compare. want to save. Once deleted, they will be gone forever. Enter your email and confirm your new password below. Would you like to turn on Help Notifications for step-by-step instructions for using our visualizer? Click the ? button at any time to turn Help Notifications off. Creating an account allows you to save your uploads and designs to view them later. You can select "Log In" at a later time to register an account and save your work. You can click this logo at any time to return to the home page. There are 2 drawing tools available to you. The Draw Line tool will allow you to create unique shapes, this is useful for scenes that have many details. 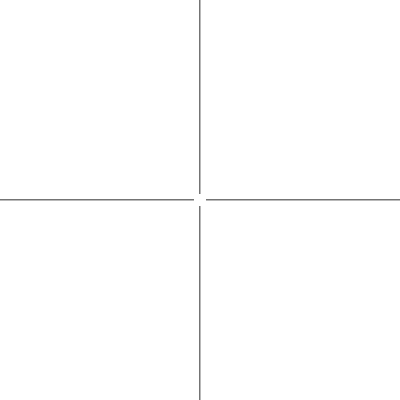 The Draw Rectangle tool allows you to create a rectangle, and then adjust the points as needed to match your perspective. There are 2 erase tools available to you . They work the same as their 'Draw Tool' counterparts, but allow you to erase mistakes, or can be used to remove scene details such as photo frames or plants from your masking layer. You can use the Zoom buttons below to increase or decrease your image preview while masking. Alternatively, you can use your mousewheel to control zoom. Did you know, when holding down the spacebar, you can click and drag the masking area to 'pan' around your image while zoomed in. Sometimes the masking toolbar can be in the way. Simply click and hold the 'Move' arrows , to drag the bar to a more convenient position. This area shows a list of your layers, as well as displays which layer is currently selected. If you have a large number of layers, use the arrows to scroll through the horizontal list. Click the green button to add a new layer. You will be asked to select a type of layer. These layer types will be referenced when applying product later on. Click the yellow button to modify the type of the currently selected layer. Click the red button to delete the currently selected layer. When you have finished masking your design using the draw and erase tools, click on Step 2 to adjust the opacity of your masking layers. The Brightness control allows you to control the opacity of your layers. Use the Preview button to see the changes. When you are happy with your layers, click the Finish button to begin applying product. You are all done masking. Return to steps 1 or 2 if you would like to make adjustments. Otherwise click 'Start Designing' to begin applying product.